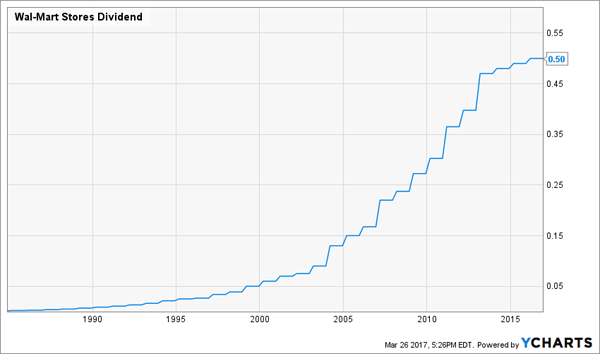 The S&P 500 Dividend Aristocrats are a group of stocks beloved as “widows-and-orphans” investments – can’t-miss companies whose stability and rock-solid dividends will keep you into old age and will exist long after you’ve passed. It’s a reassuring thought, but ultimately, it’s an illusion. Like the broader S&P 500 and the stock market as a whole, some of its members are good investments, and some – including five losers I plan on highlighting today – are not. I love the term “dividend aristocrat” … but only because it’s more honest than most people realize. The word “aristocrat” can refer to people who are many things, including superior, better able, smarter and wiser. That’s fair. Many dividend aristocrats truly are among the best companies in the world, and the best stewards of your investment money. Marie Antoinette lost her head because the aristocracy – “elite” as it might have been – wasn’t particularly good about addressing the needs of the people. That’s the problem with several dividend aristocrats. 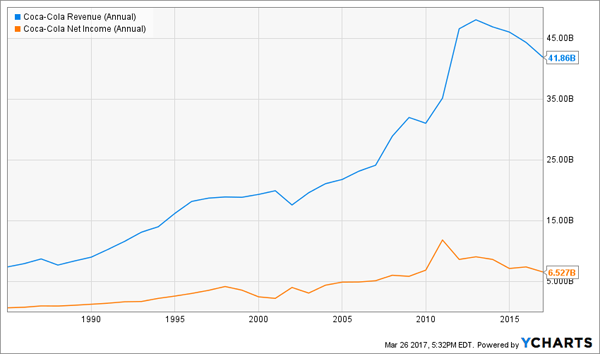 Consider this: Company A meets all the criteria for S&P 500 dividend aristocracy, including hiking its dividend 10%, maybe 15% every year – more income in your pocket, and a likely sign that the business is amply growing. Company B meets all the criteria for inclusion, including hiking its dividend 0.5%, maybe 1% every year – literally shortchanging you by not even keeping up with inflation, and a likely sign that the business has flatlined. Both companies would still be dividend aristocrats. Investors also tend to forget that dividend aristocracy isn’t eternal. Pitney Bowes (PBI) was dropped from the club in 2013 after the company halved its quarterly payout, from 37.5 cents to 18.75 cents. Let those investors eat cake. Membership today doesn’t guarantee dividends in perpetuity, and it certainly doesn’t guarantee a strong investment. So today, I want to highlight five widely held S&P 500 Dividend Aristocrats that have hiked their dividends for decades … but ultimately will be dead money that holds your portfolio back because the stock market is all about future (rather than past) performance. 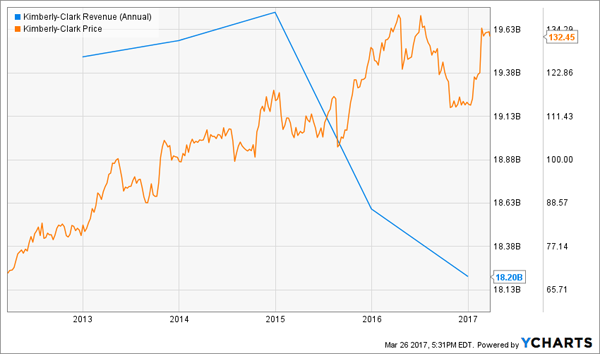 Big-box retailer Wal-Mart (WMT) has warned customers about falling prices for decades … but all the while gracing investors with rising dividends. In fact, back in February, WMT upped the ante on its payout to reach a 44th consecutive year of dividend increases. The bad news? For one, that dividend hike was a mere 2%, from $2 per share annually to $2.04, or 51 cents quarterly. Worse, payout increases have hovered around 2% for the past four years, with WMT chipping in a mere penny per share extra annually since 2014. The world’s largest retailer is never going away – not as long as the middle class continues to shrink and there’s an abundance of consumers who need low-cost goods. But competition with Amazon (AMZN) online, Target (TGT) on the brick-and-mortar high ground and Dollar General (DG) and Dollar Tree (DLTR) on the brick-and-mortar low ground has strangled Walmart’s growth prospects. Avoid Walmart. Its middling yield won’t compensate for stagnant prices. Speaking of growth woes, let’s look at another popular low-cost name: McDonald’s (MCD). Yes, this is the same McDonald’s that’s trading at all-time highs right now. And to its credit, McDonald’s always seems to have some sort of “second act” that revives faith in the company, whether it’s fighting off health criticisms with wraps and salads, or emphasizing a strength by offering all-day breakfast. But the performance in MCD doesn’t reflect reality. Revenues peaked in 2013 and have declined every year since, including a $24.6 billion top line in 2016 that was 12% lower than it was three years ago. While net income rebounded a bit to $4.7 billion, that’s still 16% off 2013 levels. McDonald’s most recent dividend increase – in 2016, its 40th consecutive year – was more robust than Wal-Mart’s, but at 5.6%, it was hardly generous. Combine that with a mediocre yield, a forward P/E that’s more expensive than the market and revenues that are expected to decline by double digits this year and next, and I have to wonder: What’s the point? At least with utilities, you know you’re not getting much in the way of growth. These plays are all about dividends and stability, and on those two fronts, Duke Energy (DUK) does a decent enough job of delivery. But that’s about the best thing I can say about Duke right now. For one, while many people believe a great coal renaissance is nigh, I disagree. Utility companies are ditching coal-fired plants left and right, replacing them with natural gas plants, which are cleaner but costlier. While President Donald Trump will try to revive coal, I think it’s past saving, and that puts a cap on DUK shares going forward. But more simply, DUK is too expensive and too chintzy. The stock trades at nearly 27 times earnings, which isn’t just high on its own – it’s high historically, too. And while the company celebrated its 90th consecutive dividend increase last July, that came in at a token 3.6% … nudging its five-year compound average dividend growth higher to just 2.7%. Kimberly-Clark (KMB) is one of several low-growth dividend aristocrats from the consumer staples sector that investors pile into for safety and reasonable yields. The rationale is fine: No matter how bad things get, people are still going to need Huggies diapers, Kleenex tissues and Cottonelle toilet paper – and that provides Kimberly-Clark with some natural defense during market downturns. So does KMB’s dividend increase streak of 45 consecutive years, which gives investors the warm fuzzies. Like McDonald’s, Kimberly-Clark is trading near all-time highs. And like MCD shareholders, KMB bulls seem to be ignoring a downtrend on the top line for the past few years, and the fact that Wall Street only sees marginal growth in the years ahead. Meanwhile, Kimberly-Clark’s dividend increases have slowed to 4%-5% over the past few years, and the stock’s P/E has ballooned back to above 20. Toilet paper and a 3% yield won’t be able to push KMB much farther from here. 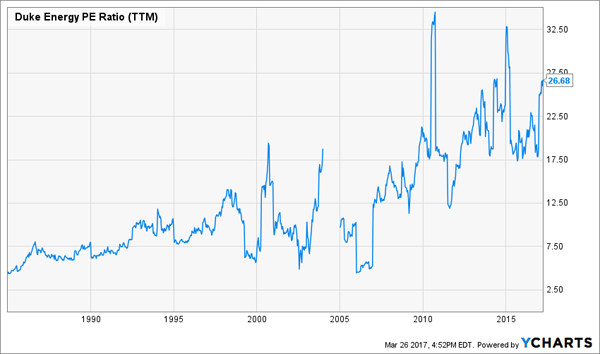 Last, we look at Coca-Cola (KO), which has improved its quarterly payout for 55 consecutive years. Simply put, Coca-Cola is in trouble. While the eponymous Coca-Cola brand is never going away completely, and while KO has diversified into other drink types, Americans (and increasingly, the rest of the world) are turning away from sugary drinks – and that’s dire news for Coke. In 2015, soda consumption suffered its 11th consecutive annual decline and fell to a 30-year low. While 2016 figures aren’t yet out, we do know that last year, American bottled water consumption surpassed carbonated soft drinks for the first time. Things don’t look to improve going forward, with cities increasingly grappling with the idea of soda taxes to boost government coffers. Coca-Cola is increasingly feeling the weight – revenues are mired in a multiyear slump, and shares trade essentially where they did four years ago. Meanwhile, dividend growth has slowed to less than 6% as of KO’s last payout hike. And yet somehow, shares still trade for nearly 22 times next year’s earnings! 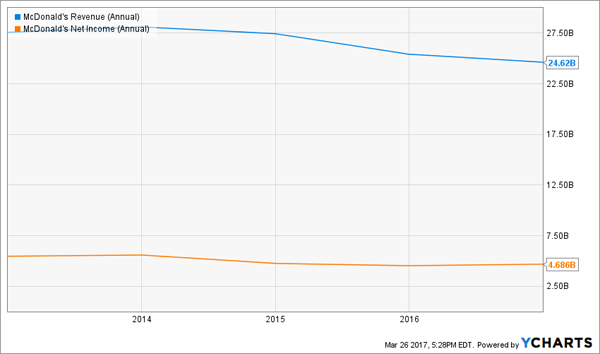 This dividend aristocrat isn’t dead by any means, but it’s certainly dead money. Coca-Cola (KO) Is Going the Wrong Way! One of the cruelest ironies I’ve come across is how many retirement portfolios hold these and other dividend aristocrats that will weigh down their nest eggs, but how few of them hold the types of big-yielding, dividend-growing dynamos that are found in my “No Withdrawal” retirement portfolio. Too many investors are suckered into buying big-name large-cap blue chips that boast safety on the promise of “big” yields … of 3%, maybe 4% if you’re lucky. But these stocks often start to rot in your portfolio with dividend increases that don’t even keep up with inflation, and tiny capital gains because they’ve given up on growth a long, long time ago. Not far. Not far at all. That’s why I’ve buried my heads in the books to compile a “No Withdrawal” retirement portfolio – a set of buy-and-hold dividend stock picks that generate yields of 6%, 7%, 8% … even a couple in the double digits, but also offer 7% to 15% upside in annual capital gains. That means you can live off dividend income alone without ever touching your nest egg – but if disaster strikes and you need to dip in, that’s OK, because you’ve grown your retirement account with these double-whammy dynamos. What makes this portfolio so effective is that it’s an all-star makeup – rather than focusing on just one area of the market, it’s the best of the best preferred stocks, REITs, closed-end funds and more. That means diversification and continued payouts against the most volatile of markets. Don’t spend your retirement hoping you can just get by on meager blue-chip returns and your Social Security checks. Collect big, regular dividend checks instead that will let you pay the bills, finance your vacations and even spoil your family. This is the path to the worry-free retirement you deserve. Click here and I’ll provide you with THREE special reports that show you the path to building a “No Withdrawal” portfolio. You’ll get the names, tickers, buy prices and full analysis of their wealth-building potential – and it’s absolutely FREE!